This month, an exciting connection was made between Islamic and Irish medicine through the discovery of a fragment of Avicenna’s Canon of Medicine bound in a sixteenth-century printed book. 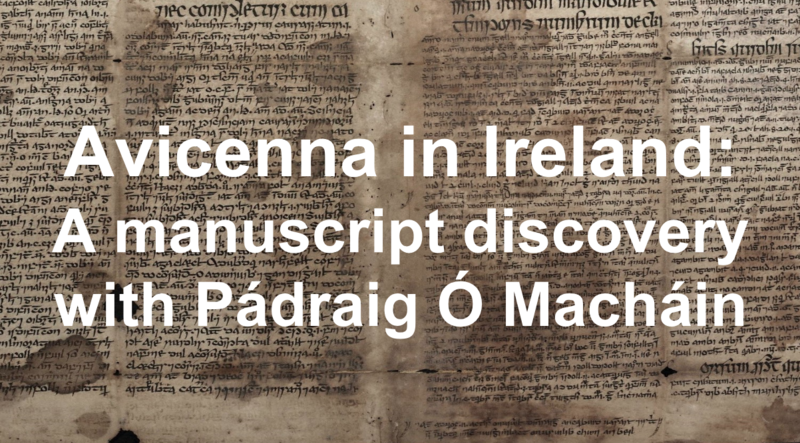 In this episode, Danièle speaks with Pádraig O’Macháin about his discovery of the very first physical evidence that Avicenna was translated and shared in Gaelic. Pádraig Ó Macháin is a Professor and Head of the Department of Modern Irish at University College Cork. He has done extensive research on Irish palaeography and codicology, Irish manuscript tradition, and the history and materiality of the Irish book. Click here to view his faculty webpage.